In a large bowl combing spinach, kale, pumpkin seeds, tomatoes, and goat cheese until well combined. In a small bowl toss apple slices in lemon juice until well doused; add to salad mix. Divide salads into containers evenly for quick access in the morning. Pour some dressing into a spill tight container to bring into work or school. Cook rice noodles according to package instructions. Heat oil in large frying pan. Stir fry cauliflower florets. Combine peanut butter, soy sauce, lime juice, sugar, and garlic in a small bowl. Stir until combined and smoothed. 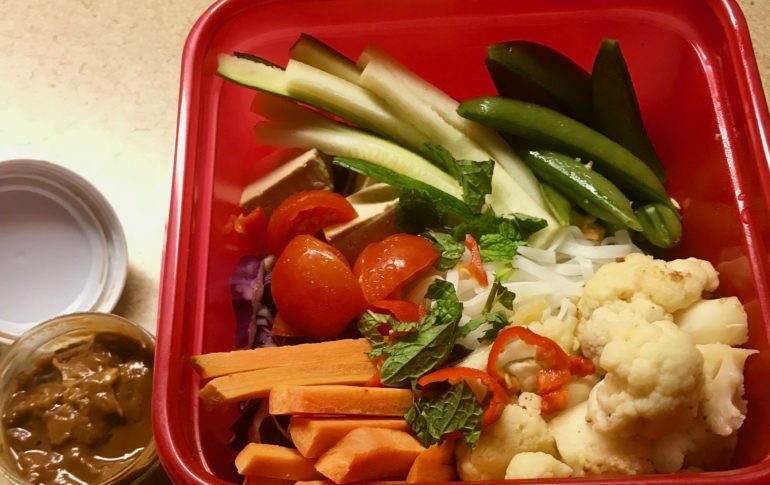 In separate containers, assemble noodles and vegetables for easy access in the morning. 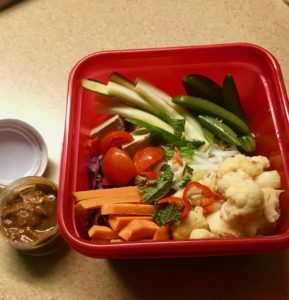 Add a portion of the peanut sauce in an leek tight container and a slice of lime before bringing to work or school. Peel and chop eggs in a large bowl. Add avocado, lime, and salt in a bowl. Mash ingredients together; add in eggs. Heat oil in a large pan over medium heat. Add sliced tempeh and cook until brown on all sides. Chop into bite sized pieces. Divide evenly into containers for easy access in the morning. Have with crackers if wanted. In a large bowl, combine the beans, tomatoes, garlic, parsley, and mint. In a small bowl, whisk the oil and lemon juice until smooth. Pour over the beans and veggies; add salt and black pepper and carefully toss with a large metal spoon. Allow to sit at room temperature for 30 minutes so flavors combine. 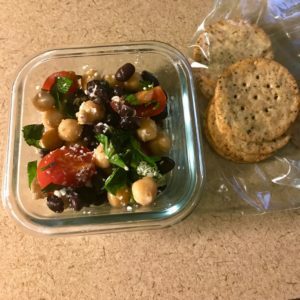 Separate beans into containers for quick access in the morning, top with grated Parmesan cheese and have with some crackers.